You’ll find no greater fan of Fairfax County parks than John Osborn. His appreciation dates back to his days as a Robinson High School student and the times he spent playing golf with friends at Burke Lake Golf Course. These days, the Sandy Spring Bank senior vice president still appreciates the game and many other things parks have to offer. “I like to take a walk in the woods, although I usually have a club in my hands,” he said jokingly, implying that his time in the woods is spent along the golf course looking for his errantly hit golf balls. The fact is, he, his family and his employer devote a lot of time and resources to the Fairfax County park system. “What we have in Fairfax County parks is astounding,” he said. “Our golf courses are well maintained, our parks are in pristine shape and the amount of history in every park is fantastic!” Over the past several years, both Osborn and Sandy Spring Bank have made generous donations to several park programs through the Fairfax County Park Foundation. 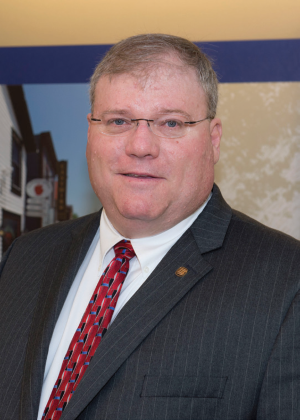 “It’s part of our bank culture to give back to the community with a commitment to making the community a better place to live, work, raise a family and run a business,” Osborn said. Whether he’s on the board or not, Osborn says he’s committed to supporting parks throughout his lifetime. “It’s about being a good citizen, and creating a safe place for kids to play and promoting a positive lifestyle for everyone,” he said. “Parks make communities stronger and that benefits everyone."